This is a reader-submitted story. My migraine attack frequency is: 18 per month on average. I take 2 medications/supplements each day for prevention and 2 medications/supplements to treat an acute attack. Currently. My first migraine attack was: as an 8 year old girl. My most disabling migraine symptoms are: the pain, the nausea, the fatigue and aphasia. My strangest migraine symptoms are: my teeth will hurt and I can’t seem to focus my eyes on anything. My biggest migraine triggers are: strong odors or tobacco smoke, bright lights, lack of sleep and loud noise. I know a migraine attack is coming on when: I get super cranky. The most frustrating part about having a migraine attack is: how it takes over my entire body, forcing me to put everything else on hold and there is very little I can do about it. During a migraine attack, I worry most about: the pain. I know it will eventually let up but I don’t know if that will be a few hours, a few days, or a couple weeks. Still, part of me still worries that one day it will start and never end. When I think about migraines between attacks, I think: I sure hope it doesn’t happen today. When I tell someone I have migraines, the response is usually: sympathetic. When someone tells me they have migraines, I think: Yes, so then you know. Then I start wondering about the details: how frequent, triggers, do they have a good doc, how do they treat, etc. When I see commercials about migraine treatments, I think: they make it sound much easier and more dependable than it actually is. My best coping tools are: distractions and laughter. I find comfort in: my hubby, my pets, my home, my loved ones, my fellow migraineurs. I get angry when people say: you just need to (fill in the blank with crazy random suggestions). I like it when people say: just let me know if you need anything. Something kind someone can do for me during a migraine attack is: be patient as I struggle to speak and bring me food. The best thing(s) a doctor has said to me about migraine is: well it was what was done, or not done – I’ve never had a doctor tell me there is nothing more they could do for me. The hardest thing to accept about having migraines is: how much it has limited what I can do. Migraines have taught me: to be more aware of what my body is telling me. The quotation, motto, mantra or scripture that gets me through an attack is: breathe, breathe, breathe. If I could get back to the early days of my diagnosis, I would tell myself: to find a migraine specialist NOW. The people who support me most are: my hubby and my mom. The thing I wish most people understood about migraine is: that they are extremely complex AND chronic migraine is different than episodic migraine. Migraine and Headache Awareness Month is important to me because: many people assume they know about migraines because it is so common. But there is a lot of misinformation out there along with a general lack of understanding of the complexity and severity of the disease. Knowledge is power. One thing I’d like to say about life with migraine is: that it’s doable. It’s horrible but it’s doable. Reader-submitted stories solely represent the personal point of view, experience, and opinion of the author, not of The Daily Headache or Kerrie Smyres. Follow this link to learn how to share YOUR 30 Things about living with a headache disorder. 1. My diagnosis is: migraine. 2. My migraine attack frequency is:1-5 times a week. They have been every day, and have had months without one. 4. My comorbid conditions include: nothing diagnosed. Have joint problems, suspected hernia, tender trigger points, muscle cramps, crushed nerve damage on left shin from a fall, acid reflux. 7. My most disabling migraine symptoms are: pain, nausea, light sensitivity, brain fog. 8. My strangest migraine symptoms are: burning muscles during an acid reflux migraine. 10. I know a migraine attack is coming on when: I can’t concentrate or get anything done. 11. The most frustrating part about having a migraine attack is: loss of productivity. It’s like my life is leaking away and I can’t stop it. 13. When I think about migraine between attacks, I think: if I eat good enough and do everything right maybe I won’t have another one. 14. When I tell someone I have migraine, the response is usually: Too much sympathy. I hate people feeling sorry for me. I just don’t want them to feel like they are being ignored. 15. When someone tells me they have migraine, I think: bummer! Hate those! 16. When I see commercials about migraine treatments, I think: I don’t watch tv, but can imagine I would be skeptical and hear the disclaimers louder than the promise. 17. My best coping tools are: ice/heat, sunglasses, ear plugs (can’t always use them), sleeping when can, isolation. 18. I find comfort in: my bed with all lights shut out. 19. I get angry when people say: n/a: I can’t afford anger. 21. Something kind someone can do for me during a migraine attack is: leave me alone, and please no strong odors or loud noises. 22. The best thing(s) a doctor has ever said to me about migraine is: n/a. Don’t go to doctors much. 24. Migraine has taught me: anger has no positive contribution. 25. The quotation, motto, mantra, or scripture that gets me through an attack is:I will get better. I will beat this. 26. If I could go back to the early days of my diagnosis, I would tell myself: look closely at the food manufacturing process. 27. The people who support me most are: my sup and my friend. 28. The thing I most wish people understood about migraine is: they can vary a lot between people and even time to time for the same person. 29. Migraine and Headache Awareness Month is important to me because: some people are becoming aware and more considerate about scents. 30. One more thing I’d like to say about life with migraine is: somehow, some way I will beat this! 9. My biggest migraine triggers are: Loud Noises, flashing lights, and eating anything with Nitrites. 11. The most frustrating part about having a migraine attack is: I never know how I will feel from day to day. 14. When I tell someone I have migraine, the response is usually: Mixed- some are supportive and understanding, some are not. I also hate it when they ask me if I have tried such and such. 16. When I see commercials about migraine treatments, I think: Really, if only it were that easy to get rid of it. 17. My best coping tools are: faith, distraction, reading, talking or curling up with my dog. 20. I like it when people say: I know it is rough, but you can make it through. 22. The best thing(s) a doctor has ever said to me about migraine is: We are going to keep trying until we find something to break the bad migraines. 23. The hardest thing to accept about having migraine is: Mine are chronic and I never know how I will feel from one day to the next. I hate having to cancel plans at the last minute. 24. Migraine has taught me: Never to give up. 26. If I could go back to the early days of my diagnosis, I would tell myself: Things will get better! 7. My most disabling migraine symptoms are: sensitivity to light and scents, and pain. 8. My strangest migraine symptoms are: when my hair hurts and when half of my face and head feel hugely swollen (when they aren’t). Oh, and I crave cold food. 9. My biggest migraine triggers are: SUNLIGHT, lack of sleep, barometric pressure changes (usually when it drops, but any change can be a trigger), dehydration, and many smells (onions and perfumes are big ones) and any kind of flashing or strobing lights. 10. I know a migraine attack is coming on when: my vision blurs and I get nauseated. 11. 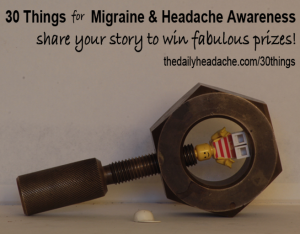 The most frustrating part about having a migraine attack is: how it limits my activities. 12. During a migraine attack, I worry most about: what my husband is having to do for me because I can’t. 13. When I think about migraine between attacks, I think: how hard it is to find a cure because everyone’s migraines are so different. 14. When I tell someone I have migraine, the response is usually: “I get them, too.” I’m amazed at how many people have them. 15. When someone tells me they have migraine, I think: “You poor soul,” and I wonder if there’s anything I can help them with. 16. When I see commercials about migraine treatments, I think: I wonder if it’ll really make a difference. Then I wonder if my insurance will cover the likely high price of the treatment. 17. My best coping tools are: A darkened room, my feather pillow, ice pack, and audiobooks. 18. I find comfort in: my husband, PJs, and my bed. 19. I get angry when people say: You have ANOTHER headache? 20. I like it when people say: They understand. 21. Something kind someone can do for me during a migraine attack is: different things at different times, really. The biggest help is when someone (my husband, usually,) just keeps my glass full for me so I don’t have to leave my dark room. 22. The best thing(s) a doctor has ever said to me about migraine is: I can help you. 23. The hardest thing to accept about having migraine is: how life-limiting they are. 24. Migraine has taught me: to appreciate little things. 25. The quotation, motto, mantra, or scripture that gets me through an attack is: I dam not really have one. 26. If I could go back to the early days of my diagnosis, I would tell myself: it’ll get worse before it gets better, and to avoid narcotics whenever possible – in the long run, they don’t help at all. 27. The people who support me most are: my husband and my daughter. 28. The thing I most wish people understood about migraine is: they’re different from “regular” headaches. 29. Migraine and Headache Awareness Month is important to me because: it helps spread the word about migraine. 30. One more thing I’d like to say about life with migraine is: I hope my friends don’t give up on me. One day, I hope to have a life without headaches. My name is Brenda and I am 34 and lived with Migraines for what feels like all of my life. I am new to living with Mulitple Sclerosis in addition to my friend the migraine and blog about living with these invisible diseases at www.stellarevoltuiondesigns.com. I also sew and knit ALOT….It was interesting to read fellow folks answers so I thought I would share mine! 3. I was diagnosed in: Migraines were part of my life for so long, but only really got properly investigated in 2010. 8. My strangest migraine symptoms are: numb side of face, mixing up names or lack of remembering them at all. 15. When someone tells me they have migraine, I think: to ask what works for them, compare notes/meds and also feel their pain. 19. I get angry when people say: I get headaches too. 20. I like it when people say: I’m sorry you have to deal with that. Is there anything I can do to help. 21. Something kind someone can do for me during a migraine attack is: my husband knows that he will have to go buy some food as any smells during an attack make it incredibly worse. 23. The hardest thing to accept about having migraine is: I’ve lived with them so long I almost prefer them to having an attack of my Multiple sclerosis because I know how to deal moderately successfully with migraines, I am still learning how to deal and accept my MS diagnosis. 25. The quotation, motto, mantra, or scripture that gets me through an attack is: I’ve got a good success rate going, survived 100% of days up to this point. 28. The thing I most wish people understood about migraine is: how hard it is to function when you have one, and how much relief can come from a dark room. 29. Migraine and Headache Awareness Month is important to me because: it opens up avenues of communication and reminds me I am not alone in this. 30. One more thing I’d like to say about life with migraine is: life goes on, make time for your own health and so accept things as they are by having back up plans B, C, D, E, F for everything.